Accrington Stanley Community Trust is delighted to announce the official release of our Impact Report for 2018. The Impact Report is a showcase of how we inspired, supported and delivered change in the communities in Hyndburn throughout the 2018 calendar year. 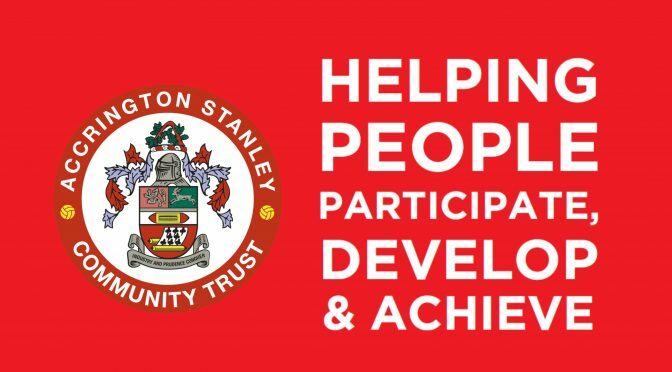 Through statistics, case studies and input from key staff, the report brings to life the stories of some of the 17,171 people we engaged with last year and how Accrington Stanley Community Trust is creating opportunities, new life chances and inspiration for those who need it most in our area. Over 6000 primary school children taking part in our activities. The report also focuses on our new £2m Sports Hub facility, new projects and key partnerships. Accrington Stanley Community Trust is the official award-winning charity of Accrington Stanley FC. Our mission is to support the local community regardless of age, gender, race, religion or skill level and promote a healthier lifestyle through sport and education by encouraging individuals to take part in fun based activities, which develop confidence, co-operation and education. You can read the full contents of the ASCT Impact Report 2018 by clicking here.